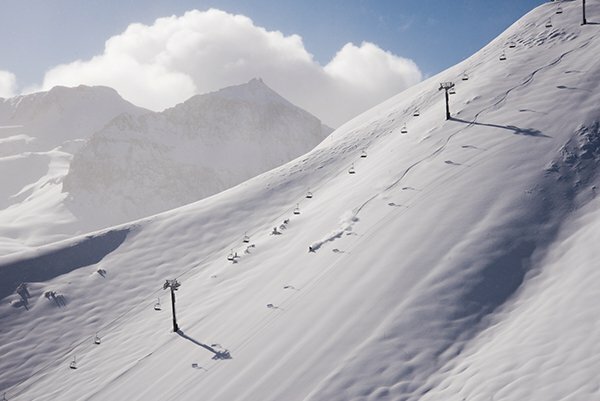 A rapid succession of storms in the past couple of weeks have brought feet of snow and Telluride is in the hub of another delicious storm cycle. Weather forecasting is a tricky endeavor, but Telluride Magazine always turns to renowned local guru Jerry Roberts when it comes to anticipating our fickle mistress. What does Jerry say? Up to a foot tonight through Thursday, and another storm coming on Sunday or Monday. That’s great news for the ski resort. They opened Gold Hill terrain this week (Electra, Dynamo, Millions, and Little Rose) and today they opened the hike-to goodness off the Prospect lift (Confidence, Crystal, and Genevieve) as well as Holy Cow and Runaway Train off Lift 10. And Revelation Bowl should be open by Saturday. Despite a slow start to the ski season because of delayed snowfall, about 90 percent of the resort’s developed terrain is open—and the skiing/snowboarding is terrific. *Insider secret: Jerry Roberts spent decades as an avalanche forecaster in the San Juan Mountains and in Chile, and he still works as an occasional weather consultant for Hollywood et al. Roberts is semi-retired but his forecasts are absolute gold. Follow him on his blog to get the latest updates. Full disclosure: Roberts officiated my wedding a decade ago in September in Telluride. And yes, it snowed.